A truly painting trail between natural and historical beauties on the border with the Czech Republic! We were living in Prague to knowing its surroundings. We had already gone in the National Park of Bohemia Switzerland (the Národní park České Švýcarsko, in Czech), we already talked about him and his tracks in this other post. On the other side of the border, in Germany, this natural area continues but changes its name, becoming the National Park of Saxon Switzerland (Nationalpark Sächsische Schweiz in German). The paths cross from side to side, complementing incredible scenery! One of the main paths of the region is the Malerweg Trail – translating is the “Path of the Painter”. The trail has a length 112 km (17 km per day) and takes 7 or 8 days – on average. Its path leads to historic sites, incredible views and different rock formations, all crossed forests that seem to have come out of fairy tales. The name Malerweg – “Path of the Painter” is because to the artists Johann Carl August Richter, Johann Alexander Thiele and Caspar David Friedrich, of the romantic period in the 18th century, who found the perfect aesthetic in this region for their work. The vivid colors, the rocks, the river, and the stunning landscapes were the subject of his paintings, as well as inspiring other arts. Then, walking through Malerweg you can see many of the areas used in the famous paintings of this period. 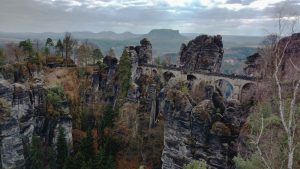 We decided to hike the part of the trail until the region postcard: the Bastei Bridge. We arrived by train to Kurort Rathen, a beautiful little town with hot springs close to the River Elbe. The first step was to cross the river with a ferry, which goes back and forth, charging € 1.00 for the stretch or € 1.80 round trip. The scenery has already started lovely and also motivating because there are several marked trails in the region: some longer, others circular, and even shorter options with little difference, allowing all the hiking, regardless of their level, to enjoy the park. We decided to hike on the TK8, which is circular and not very long, as we arrived at Kurort Rathen already after 11 a.m. and it was the end of winter with the day even shorter. The TK8 has a length of 6 km with elevation gain/loss 300 meters, easy to hike, despite its about 500 steps (literally!)! Leaving the town, we enter the park “officially” and the climb begins. Less than 1 km after the trail begins, we have reached the first viewpoint, which gives a beautiful view of the Elbe River, Kurort Rathen and also Stadt Wehlen. Stone walls are challenged by climbers (try to find the colored dots – the climbers – on the first rock from right to left in the photo below), but you do not have to make as much effort to enjoy the beautiful scenery. Back to the trail, we crosses rocks, continued up several stairs, until we came across a cluster of people. Yes! We arrived at Bastei Bridge! But you can only realize that when you’re on top of it! The bridge was originally built in 1824, connecting a series of rock formations under the River Elbe. It has a height of 194 meters and forms a beautiful scenery. There are several belvederes to enjoy it. Near the bridge there is a restaurant and a very sumptuous hotel, as well as souvenir shops. We found that the bridge is easily reached by car, arriving at the parking lot near the hotel and another 300 meters away! If it’s on the bridge! So, if you do not want to walk so much, you already have a choice! Following the trail, we back to the forest, where boulders and mosses mix, there is a lot of humidity, and the ground becomes quite slippery. The next stop, after 2 km, was the Amselfall, a beautiful waterfall, but that is “hidden” between some buildings that serve as restaurant and information center of the park in the summer. Climbing the staircase next to the Amselfall waterfall, there is another 1.5 km to Rathewalde, a lovely small town. Another option is to take the path that follows to Hohnstein (photo below), where there is a fort and a beautiful castle on the edge of the cliff. Returning to Kurort Rathen, we passed the Amselsee, a dammed lake, but they were doing a work in their surroundings, then the scene was desolating. And 1 km more we were back in the city. Malerweg continues … we would love to go through it completely, but we would need to be away for at least 5 full days without internet (or with very restricted access), which our work does not allow. Want to know what we do and know more about our digital nomadic lifestyle? See our blog! The train is the best way to get to Kurort Rathen or any other town bordering the Malerweg Trail. Coming out of Prague, we bought a cheaper ticket option, and therefore with more stops. We did the Praga-Decin stretch; Decin-Bad Schandau; Bad Schandar-Kurort Rathen. There is a more expensive option that follows direct Prague-Bad Schandau and from there picks up the regional train up to Kurort Rathen. From Dresden, Germany, there is a regional train that runs direct to Kurort Rathen. See the Malerweg informations and maps click here. All cities where Malerweg passes have a good structure of hotels and restaurants. However, between cities there is nothing, so it is good to bring water and an emergency snack. For those traveling the entire Malerweg, hotels in the area offer a luggage storage service to the next destination. This is very convenient, since you do not have to carry your 10/15 kg freighter, just a backpack of the day. We do not know how much the service costs. There is more information on this link.